Those words never fail to send a chill up my spine. The idea that One who “knew no sin” would take my sin — and yours — upon Himself is almost more than I can fathom. 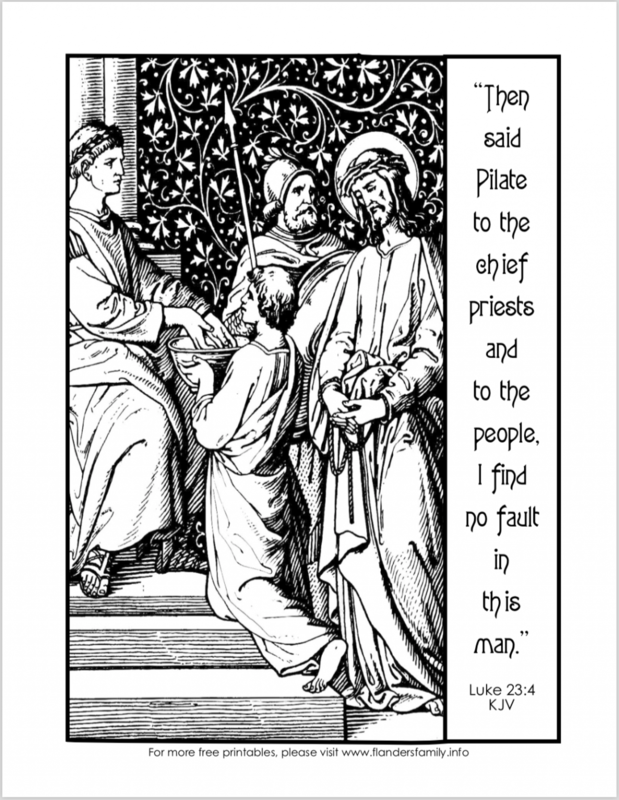 Even Pilate recognized the fact Jesus had done nothing deserving of death. “I find no fault in this man,” he declared to the mob gathered at Christ’s trial. He could have searched from now to eternity and never discovered any fault — for no fault was there. Christ was perfectly sinless — yet He willingly bore the weight for our “every bitter thought and every evil deed.” Truly, there is no greater love! I love the beautiful artwork in these public domain illustrations. I used acrylic paint on the page borders and Prismacolor pencils to fill in the scene. 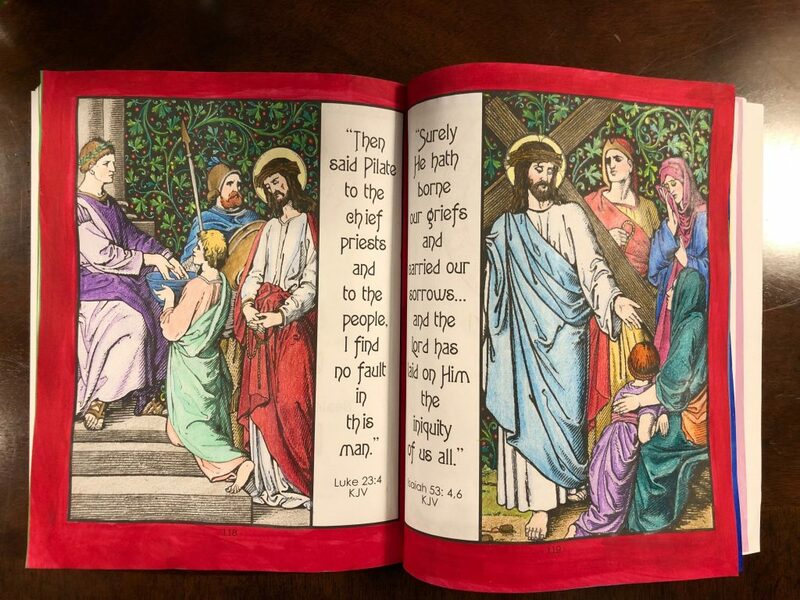 For those interested in coloring the matching illustration, I published a printable of the facing page last Easter. You can download that one here. I got busy this week and didn’t do a very good job promoting this giveaway. That means low entries, which increases your odds for winning. But don’t delay. The contest ends at midnight tonight! The coloring page is just beautiful! Much of my joy this Lent has been in watching my children rejoice in finding ways to give. Each year a new deeper understanding of Jesus’ sacrificial Love for us is revealed to myself and my children through Lent. I love seeing their understanding and awe for our Savior grow. My girls are young, so to celebrate Easter we generally read through the Bible story, then go through different symbols and their meanings with our resurrection eggs. As my girls get older I love hearing how they are really grasping the true meaning of Easter, even past the candy and bunny distractions! Aren’t those Resurrection Eggs the sweetest thing? Whoever came up with that idea was brilliant. My kids and grandkids love reviewing the Easter story that way! This journal looks great! 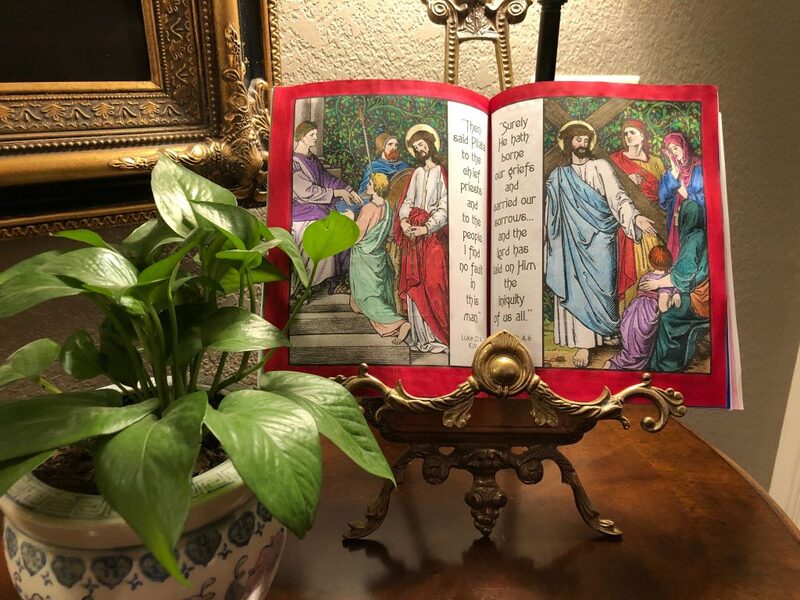 I love to spend my time before Easter reflecting on the story of how our Savior redeemed us and trying to convey that to my children through bible study,books and resurrection rolls. It’s been a few years since we’ve made resurrection rolls, Lydia. Got to get that recipe out and rekindle that tradition — maybe with grandkids, too!